The Swifter® CTX Series industrial fan is a next generation cooling tower and air cooled heat exchanger fan. With patented airfoils, the CTX Series fiberglass fans are specifically designed to provide higher efficiency without compromising on fan performance. The CTX Series are amongst the highest efficiency airfoils available. See complete list of industrial fan features and benefits. In addition to a cutting-edge airfoil design, the CTX Series fan blades incorporate proprietary technology to produce a composite blade comprised of a uniform fiberglass outer skin integrated with a high density inner foam core. The result is a structurally superior lightweight fiberglass (FRP) fan blade that also vibrates less. Furthermore, due to the high density foam core structure, the CTX Series blades experience less surface warping and deflection during higher pressure loadings; for this reason, the blades are better able to maintain the integrity of the airfoil shape as compared to hollow core fiberglass blades, thereby minimizing air turbulence. 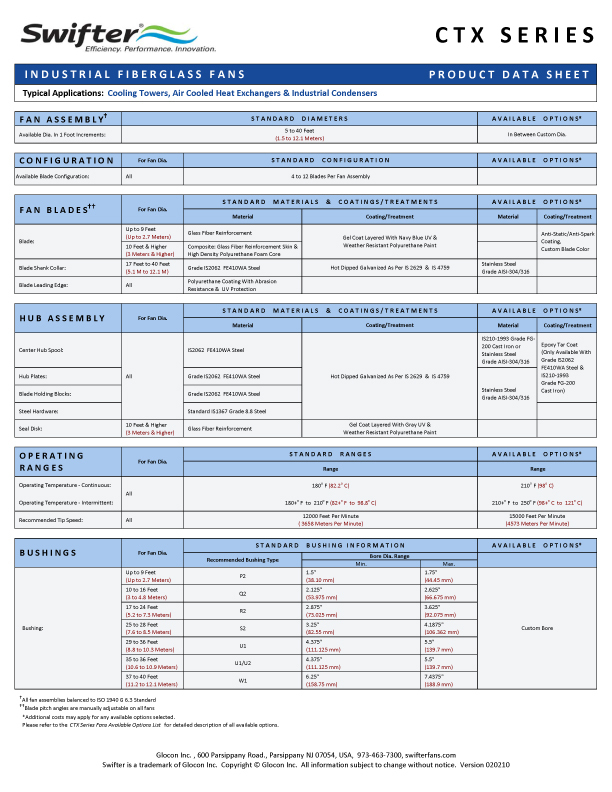 For detailed industrial fan product specifications, material specifications, operating ranges, and standard bushing information, download the CTX Product Data Sheet. 5 ft., 7 ft., 8 ft., 9 ft., 10 ft., 11 ft., 12 ft., 13 ft., 14 ft., 15 ft., 16 ft., 17 ft., 18 ft., 19 ft., 20 ft., 21 ft., 22 ft., 23 ft., 24 ft., 25 ft., 26 ft., 27 ft., 28 ft., 29 ft., 30 ft., 31 ft., 32 ft., 33 ft., 34 ft., 35 ft., 36 ft., 37 ft., 38 ft., 39 ft., 40 ft.
To make your fan selection and request a quote, please access our online Fan Selection Program. Data on CFM, performance curves, weights/dimensions, and noise are also available.